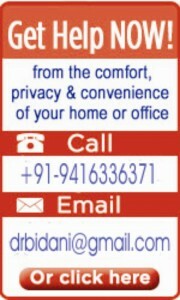 Dr. Bidani’s Centre for Homoeopathy site, consultation and homoeopathy medicines recommended by Dr. Sushil Bidani, Dr. Navneet Bidani and Dr. Neha Bidani, is strictly to support and not to replace, the relationship that exists between a patient/site visitor and his/her existing physician. Homoeopathic medicines work as per nature’s therapeutic laws, as Homoeopathy is based on fundamental laws of universe. It helps to eliminate toxins in the body and do not produce any side effects by adding new toxins in the body. Because of varieties of diseases and their complexities, we do not claim to cure each and every case, disease or symptom, nor do we guarantee any magical cure. The homoeopathic medicines are essentially free from side effects because of its simplicity. Dr. Bidani’s Centre for Homoeopathy, Dr. Sushil Bidani, Dr. Navneet Bidani and Dr. Neha Bidani shall not be liable for any direct, incidental, special, consequential, indirect or punitive damages, loss of (or loss of use of) data, data corruption, availability of website, loss of income or profits that result from you registering at Dr. Bidani’s Centre for Homoeopathy and taking the recommended homoeopathy medicines given Dr. Sushil Bidani, Dr. Navneet Bidani and Dr. Neha Bidani. Homoeopathy treats person as a whole along with the disease. Treatment is based on selection of the medicines having similar symptoms to that of the patient suffering from disease (symptom similarity). It is the skill of a physician developed over the years of practice. Please note that it is not possible to provide any elaborate explanation in terms of recommended formulae. Dr. Bidani’s Centre for Homoeopathy reserves the right to revise its fee structure and policies at any time without prior notice.